We are connected to the sea in our backyard. 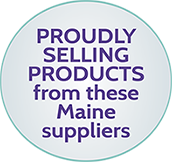 We are committed to our hard-working local clam diggers, lobster people, farmers, our close and supportive community, and the many local businesses making flavorful, honest, Maine foods. Peekytoe Provisions is your year round source for from scratch prepared foods, lunch and lighter fare, fresh oysters, sustainable seafood, local shellfish, local and imported cheeses, Maine made specialty foods, and delicious homemade desserts. Peekytoe is absolutely committed to sustainable and renewable practices, from energy to fisheries. We are currently the only business supporter of the Bar Harbor Community Solar Farm, and our electricity is 100% solar. We compost all of our food waste, including lobster, clam and oyster shells, and all vegetable matter. We recycle everything possible — cardboard, paper, aluminum, plastics & glass, right down to our kitchen tickets. Our take out containers are made from sugar cane and recycled materials, and our utensils are biodegradable, made from corn instead of plastic. 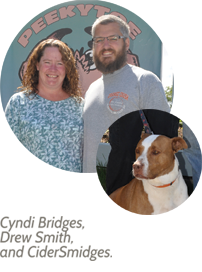 Peekytoe Provisons was established in 2014 by Cyndi Bridges and Drew Smith, with help from Cider Smidges, friends, family, and the MDI community.